Bonagee United who beat Swilly Rovers on Wendesday night. The new Ulster Senior League season is up and running with the first games in the Donegal News Ulster Senior League, League Cup played on Wednesday night. There was one game postponed - the meeting of Letterkenny Rovers and Finn Harps Reserves was called off just hours before kick-off. But two games went ahead and there were wins for Cockhill Celtic and Bonagee United. Cockhill Celtic, last season’s double winners - indeed, the double winners six seasons in a row now - came from behind to overcome Derry City Reserves. It was the visitors who started the brighter of the two sides and they had the home side well pinned back for the first 15 minutes. Cockhill handed a debut to goalkeeper Jason McCallion and the young netminder was alert to the first chance on 16 minutes when he got down well at his near post to gather a dangerous free from Kieran Farren on the left corner of the area. The visitors opened the scoring on 30 minutes when Devine and McBride combined well on the right for the ball to find its way to Cathal Farren inside the area and the young number nine made no mistake from 10 yards. Cockhill did have loud appeals for off-side but the referee awarded the goal with no flag from his assistant. The game was end to end but derry looked the more dangerous and only for a few stray passes in the final third the Candystripes should have added to their score. Cockhill seemed to be rushing each and every time they had possession and the ball was turned over on numerous occasions. The second goal for Cockhill arrived on 42 minutes when Gerry Gill curled home a delightful free from the edge of the area after Mark Moran was brought down by Gormley. Derry pushed the home side back again early in the second period but found the home defence on top with Breslin and Doherty superb throughout the 90 minutes. The game turned into a midfield scrap for a period in the second half with both sides guilty of giving up possession all to easy and forcing the pass when the simple thing would be to keep possession. On 75 minutes Derry were awarded a free 25 yards from goal, Farren stepped up to strike a fierce shot that forced a brilliant diving save from McCallion that he pushed away for a corner. Cockhill had a great chance on 80 minutes to put the game safe but after substitute Nash broke away he made his way into the box but rather than cross to the unmarked McLaughlin for an easy tap in he saw the hedlines and went for the shot that was beat away by Gartside and cleared by Tweed. Cockhill managed the last ten minutes well under a siege of pressure to claim a valuable three points in a group that saw the game between Finn Harps Reserves and Letterkenny Rovers postponed. Cockhill Celtic: Jason McCallion, Conor McNamee, Lee McColgan, Peter Doherty, Jason Breslin, Denim McLaughlin, James Bradley, Gerry Gill, Gerard McLaughlin, Brendan McLaughlin, Mark Moran. Subs: Daniel Doherty for D.McLaughlin (61), Aaron Nash for G.McLaughlin (70), Daniel Martin Doherty for Moran (71), Paul McDermott for McNamee (88). Derry City Reserves: Nathan Gartside, Rhys McDermott, Fionn McClure, Connor Gormley, Kieran Farren, Evan Tweed, Jack Malone, Darren Armstrong, Sean McBride, Cathal Farren, Dylan Devine. Sub: Mikey Friel for Armstrong (53). Swilly Rovers, pictured before Wednesday night's cup clash with Bonagee United. A cracking eight goal thriller at Swilly Park with Bonagee just shading it in the end. The large crowd witnessed a very hard fought encounter played on an excellent playing surface. Marty McDaid went close on 15 minutes when denied by Bonagee ‘keeper Kealan Mulcahy with a stunning save. Swilly went ahead on 37 minutes when Tony McNamee released McDdaid and he fired home via a defection. Michael Doherty put Bonagee ahead following a Garbhan Grant cross. A minute later, Doherty set up Grant who headed home from close range. Deano larkin made it four on with the home defence appealing for offside. However, McDaid slammed home on 60 minute to make it four-two. Matthew McLaughlin made it four-three on 70 minutes, firing home after a solo run. Garbhan Grant fired home near the end to make it five-three. 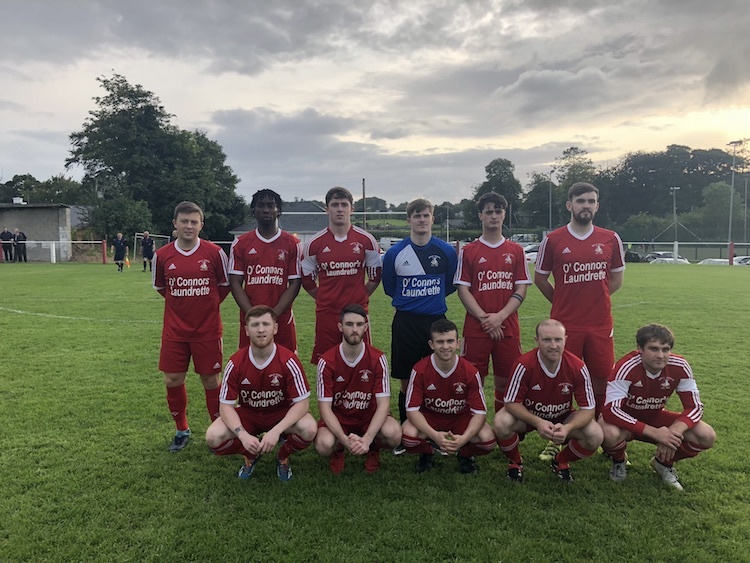 Swilly Rovers: Gareth Muldoon; Ryan McDaid, Duncan Patterson, Dylan Hegarty (Matthew McLaughlin 64), Sean Crossan; Brandon Toye (Brad Patterson 67), James McCahill, Tony McNamee, David Fisher (Jordan Nugent 60); Marty McDaid; Kennedy Boachie-Ansah. Bonagee United: Kealan Mulcahy; Mark Harkin, Sean Hume, Thomas McMonagle; Codey Brogan, Michael Funston, Jamie Lynagh, Jordan Armstrong, Micheál Doherty (Aaron Watson 60); Garbhan Grant (Jack Murphy 90), Deano Larkin (Daniel Stolarczyk 88).